Leeches (Euhirudinea) are relatives of earthworms and are included in the phylum Annelida (Brinkhurst, 1991; Davies, 1991; Davies and Govedich, 2001; Govedich, 2001; Siddall and Burreson, 1996; Zrzavy et al., 1998). Sawyer (1986) placed the leeches and oligochaetes (earthworms, etc) in the phylum Uniramia as a subphylum (Clitellata) along with the Onychophora, Myriapoda (millipedes and centipedes) and Hexapoda (insects). There is little evidence to justify this placement and recent research indicates that both oligochaetes and leeches should be retained in the phylum Annelida with the Polychaetes (sandworms) (Davies and Govedich, 2001; Govedich, 2001; Zrzavy et al., 1998). Unlike other annelids, true leeches as a group lack chaetae (bristles or hairs) and have a fixed number (32) of postoral somites or segments. Most annelids (Polychaetes and Oligochaetes) have a variable number of segments and can add additional segments during growth. They also have small hairs or chaetae that are used to attach to a substrate and for locomotion. The only "leeches" with chaetae are the Acanthobdellida. This small group of annelids are not considered "true leeches" (Euhirudinea), however, they are closely related to the true leeches and have a fixed number of somites (29), but as a group they have retained chaetae. Another closely related "leech" group are the Branchiobdellida. Like the true leeches, this group lacks chaetae and has a fixed number of somites (15-16). Acanthobdellids and branchiobdellids lack the complex reproductive structures found in true leeches in addition to having a different number of fixed somites and can be distinguished from the true leeches by these characters. In addition these two groups typically lack the anterior sucker whereas all "true leeches" have both an anterior and a posterior sucker (Brinkhurst, 1991; Davies, 1991; Davies and Govedich, 2001; Govedich, 2001; Siddall and Burreson, 1996). Leeches (Hirudinoidea) can be separated based on a number of characteristics including mouthparts and reproductive structures. The Rhynchobdellida have a small mouth located within the oral sucker and a protrusible proboscis. These leeches lack both jaws and teeth. Families include: Glossiphoniidae, Piscicolidae, Ozobranchidae. The Arhynchobdellida have larger mouths that nearly fill the entire oral sucker and many have muscular ridges that may be armed with jaws. Jawed families include: Haemopidae, Hirudinidae, Haemadipsidae. 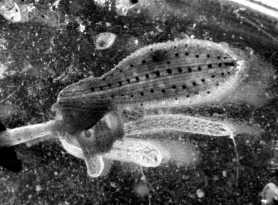 Jawless families include: Cylicobdellidae, Americobdellidae, Erpodellidae. Leeches (Euhirudinea) are unusual in that as a group they are entirely carnivorous, feeding on a variety of invertebrates and on vertebrates. Many are sanguivorous meaning that they feed on the blood of vertebrates such as amphibians, birds, reptiles, fish and mammals (including humans). Leeches are an important part of aquatic ecosystems acting both as predators and as prey for vertebrate and invertebrate predators. They can often be found attached to the undersides of rocks, vegetation, logs and other submerged substrates. Many are sit and wait predators feeding on insect larvae, snails, crustaceans and oligochaetes (worms). 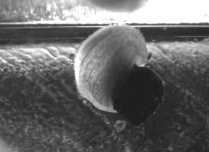 Predacious glossiphoniids feeding on snails. Helobdella papillornata (Left), Alboglossiphonia australis (Right). Some are active predators feeding on free-swimming prey directly in the water column (See Motobdella montezuma (Davies et al., 1985; Davies and Govedich, 2001; Govedich, 2001; Govedich et al., 1998). Others are sanguivorous feeding on the blood of fish, amphibians or water birds. Leeches are also a good food source for fish and other aquatic vertebrates and in some parts of the world (U.S.A.) are grown commercially as bait for fishing. In eastern Queensland and New South Wales a new species of leech, Bassianobdella bundabergii has become a pest for earthworm farmers. These leeches have started feeding on the earthworms grown to be sold for garden mulching, and as a result may pose potential problems for gardening and for the export and sale of earthworms. Medically leeches are still important as a source for pharmacological products such as anticoagulants and vasodilators used in the treatment of heart disease. They are also used in plastic surgery to prevent bruising and in the re-attachment of amputated limbs (Govedich, 2001; Govedich, 2004). 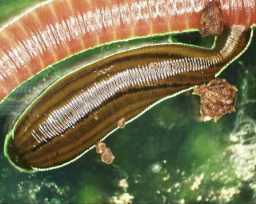 Leeches move by either an undulating swimming motion (eel-like) or by an "inch-worm" like crawling motion using the anterior and posterior suckers. The posterior sucker is attached to a substrate and the leech stretches out and attaches to the substrate with the anterior sucker, the posterior sucker is then detached and pulled up to the anterior sucker (Sawyer 1986; Govedich 2001). Brinkhurst, R.O. 1991. Annelida: Oligochaeta and Branchiobdellida. In: Ecology and Classification of North American Freshwater Invertebrates. J.H. Thorp and A.P. Covich eds. Academic Press Inc. San Diego. 401-435. Davies, R.W. 1991. Annelida: Leeches, Polychaetes, and Acanthobdellids. In: Ecology and Classification of North American Freshwater Invertebrates. J.H. Thorp and A.P. Covich eds. Academic Press Inc. San Diego. 437-479. Davies, R.W. and F.R. Govedich. 2001. Annelida: Euhirudinea and Acanthobdellidae. In: Ecology and Classification of North American Freshwater Invertebrates. J.H. Thorp and A.P. Covich eds. Academic Press Inc. San Diego. 465-504. Davies, R.W., R.N. Singhal and D.W. Blinn. 1985. Erpobdella montezuma (Hirudinoidea: Erpobdellidae) a new species of freshwater leech from North America. Canadian Journal of Zoology 63:965-969. Govedich, F.R. 2001. A reference guide to the ecology and taxonomy of freshwater and terrestrial leeches (Euhirudinea) of Australasia and Oceania. CRC for Freshwater Ecology, identification guide no. 35. pp. 67. Govedich, F.R. 2004. Tender loving leeches. Australasian Science, 25:16-22. Govedich, F.R. D.W. Blinn, P. Keim and R.W. Davies. 1998. Phylogenetic relationships of three genera of Erpobdellidae (Hirudinoidea), with a description of a new genus (Motobdella) and species, M. sedonensis. Canadian Journal of Zoology, In Press. Sawyer, R.T. 1986. Leech Biology and Behaviour: Vol. II, Feeding Biology, Ecology, and Systematics. Oxford Science Publications, Clarendon Press Oxford. 646-706. Siddall, M.E. and E.M. Burreson. 1996. Leeches (Oligochaeta? : Euhirudinea), their phylogeny and the evolution of life-history strategies. Hydrobiologia 334:277-285. Zrzavy, J., S. Mihulka, P. Kepka, A. Bezdek and D. Tietz. 1998. Phylogeny of the Metazoa based on morphological and 18S Ribosomal DNA evidence. Cladistics 14:249-285.